AsLing President João Esteves-Ferreira announced that AsLing would award the presenter of the talk found to be the best, on the basis of returned conference evaluation forms, one free attendance at next year's (2017) TC39 conference. Gold Sponsor, MateCat, and Silver Sponsor, SDL, awarded prizes to individual participants. 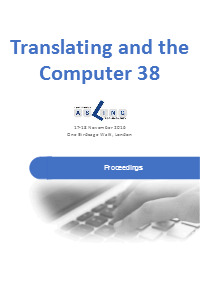 Next year's 39th Translating and the Computer conference will take place in London on 16 and 17 November 2017.